An international study of children’s perceptions of cigarette package warning labels found that the majority of children are unaware that they exist. Children in countries where larger warning labels are used, and which include a compelling graphic image of the negative health impacts of smoking, were more likely to be aware of and understand the health risks of tobacco products. The study, led by Dina Borzekowski, Ed.D, in the University of Maryland School of Public Health (UMD), and Joanna Cohen, Ph.D., Johns Hopkins Bloomberg School of Public Health (JHU), showed that only 38 percent of children had any awareness of warning labels currently being featured on cigarette packages. Even after showing warning labels to participating children, around two-thirds (62 percent) of the children were unable to explain what the health warnings were about. 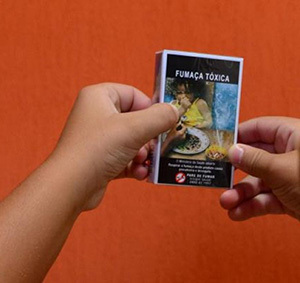 Among the six countries studied, awareness and understanding of health warning labels was greatest among children in Brazil, where graphic warning labels, often featuring extremely gruesome pictures, have been featured since 2002 and cover 100 percent of either the front or back of the cigarette package. Their findings, published in the Journal of Public Health, offer data from a sample of 2,423 five and six year-old children interviewed in Brazil, China, India, Nigeria, Pakistan, and Russia about their awareness and understanding of cigarette health warning labels. “Pro-smoking messages are reaching the world’s most susceptible audiences,” explains Borzekowski, research professor in the UMD's Department of Behavioral and Community Health. “We need to do a better job globally to reach children with anti-smoking messages. To do this, health warning messages should be big and clear, especially for low-literacy populations, children and young people.” According to the World Health Organization’s Framework Convention on Tobacco Control (FCTC), tobacco product packages and labeling should effectively communicate the health risks associated with tobacco use, and that the effectiveness of these health warnings and messages increases with their prominence and with the use of pictures. This new study follows recent work by Borzekowski and Cohen published in the journal Pediatrics in October 2013. The earlier piece, drawn from the same sample of five and six year olds, provided evidence that young children recognize cigarette brands. More than two-thirds could identify cigarette brand logos, with the highest percentages in the sample from China (86 percent could identify at least one brand). This work was supported by the Institute for Global Tobacco Control’s (IGTC) at the Johns Hopkins Bloomberg School of Public Health, with funding from the Bloomberg Initiative to Reduce Tobacco Use.